Am I the only one out there that enjoys this combination? 2 fingers for the brake, 3-4 for the clutch - it's just the way I ride. So I thought great, just get a set of those adjustable length levers and set it up like that. Only problem is, IMO, those adjustable length levers feel ab-sol-ute-ly horrible!!! So what I need is a good quality shorty brake lever, and a good quality standard length clutch lever (pazzo type stuff with easy reach adjustment), but no bugger seems to sell them individually - they all come in pairs, i.e short brake & clutch or long brake & clutch. So, does anyone know a good vendor for this requirement, have a short brake lever for sale, or have any other bright ideas? So you want them to match, is that it? You don't want a pazzo stubby on one side and the stock long lever on the other? I never thought of this. I might think about it for me. I've been using clutchless shifting as often as I can. It doesn't work of course for downshifting. Hmm.... I don't follow. I have adjustable length levers that I like quite a lot better than the stock levers. If it stops raining, I will try take and post some photos. Levers like these are the ones I bought (albeit not as expensive or quality as the Ducabike example here) but the sliding design to extend the length of the lever is the same. And I just hate the way the feel - fully closed or extended - something about that non-flowing feel that just bugs me. So if I want a full length clutch lever, and a short brake lever, what's the options beyond buying a pair of each? Hope that clears up the predicament somewhat!! 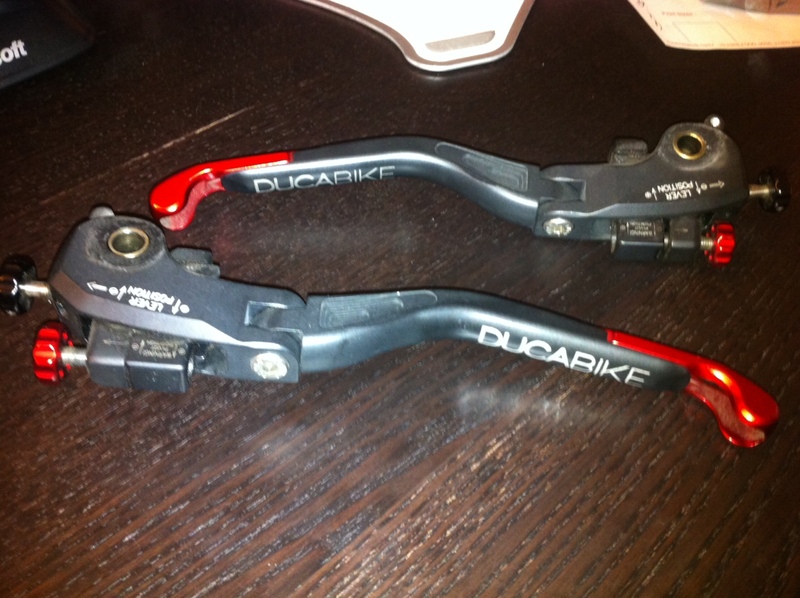 These are the adjustable levers from Carbon House, which I imported direct from Italy and installed some months ago. They have been great. Very nice quality/fit/finish. I wasn't looking for adjustable length (mainly looked for them to be adjustable to be much closer to the handgrip for 1-2 finger control), but I like the feel and the grip much better than stock. They have a relatively square face, which seems wrong, but it actually gives a much larger surface for the gripping fingers to hold/squeeze than a thinner lever. I will look up the cost, if interested. Thanks for the tip blueswede - my levers are very much of the same design but it's the kinda 'dip' where the lever transitions from the main body to the extendable section that I don't enjoy the feel of so much. I could see myself getting used to it, but being ever the perfectionist I need to find a way to purchase one 'fixed length' (but still reach adjustable) short lever and one long one. The search goes on! Got a set like that from China for about $40.00. They're nice but I'm a little bummed they're not much shorter. Also lost the ability to pull the clutch and start the bike in gear with the sidestand down. hmmm - not sure I miss that or not.